A report on deer in the Scottish Highlands is a sycophantic paean to Balmorality and landed power. I’ve read too many daft reports in the course of this job, but I don’t remember any as self-defeating as this. This morning the Scottish Gamekeepers’ Association launches its study on the economic importance of red deer to Scotland’s rural economy*. It succeeds in demonstrating the opposite of what it sets out to prove. The association represents people working for the big estates of Scotland, which are visited at certain months of the year by a small number of exceedingly rich people, who come to shoot stags or grouse. These estates are mostly in the hands of absentee landlords. Often their ownership is channelled through trusts registered in tax havens. In some cases it’s not possible to discover who owns the trusts. The Highlands of Scotland have one of the most concentrated landholding patterns in the world. It’s a legacy of the Clearances which followed the Battle of Culloden in 1746. Small farmers and commoners were driven off their land and their homes were destroyed. Many ended up in the slums or were forced to emigrate. The land was turned from a multi-culture into a monoculture: devoted to nothing but sheep on some estates and red deer on others, for the enrichment or exclusive enjoyment of the aristocrats who owned it. Scarcely any employment was required to manage the sheep and deer. The Highlands, once a populated, lively, culturally-diverse region, became almost void of people. Their stories were replaced, for the amusement of the new owners, by a mythologised version, like Marie-Antoinette’s Hameau de la Reine at Versailles. 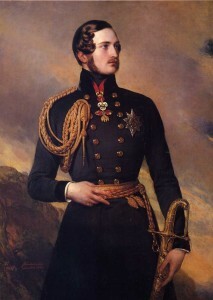 The ersatz culture they created, pioneered by Victoria and Albert – all tartans and claymores – is often called Balmorality. It is exemplified by Edwin Landseer’s 1851 painting The Monarch of the Glen. 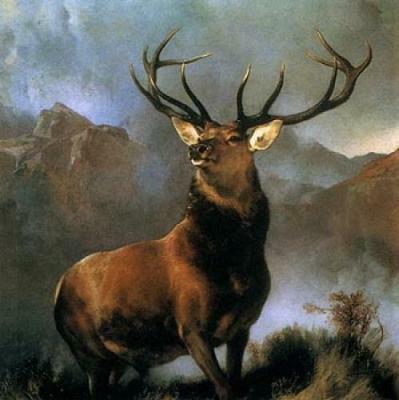 This depicts a magnificent stag, overfed and splendidly pointed, eyes raised imperiously to the hills: both the idealised quarry of the new lairds and their own imagined embodiment. 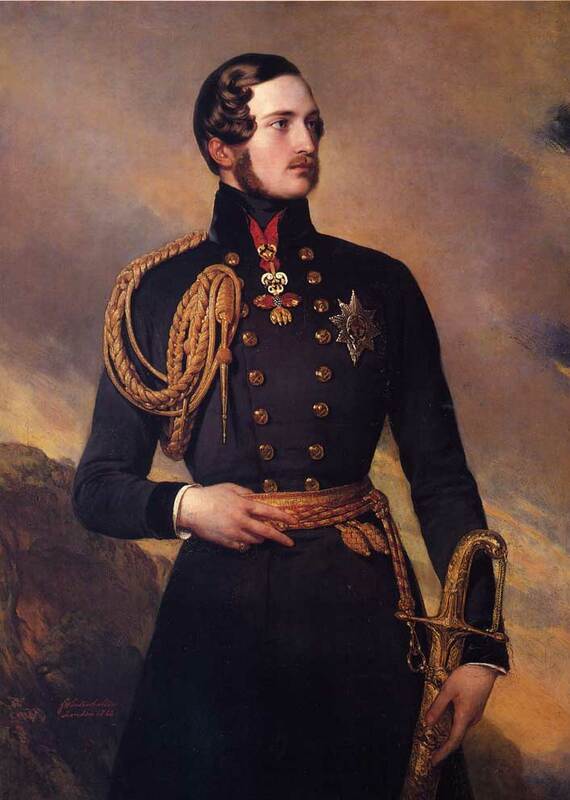 The pose, gaze and setting bear, to my eyes, a striking similarity to Franz Winterhalter’s 1842 portrait of Prince Albert. It was not only the people who disappeared. As sheep thronged the hills, as the number of deer – without natural predators, protected from other human hunters and fed in the winter – rose, the great Caledonian Forest, which had already retreated, began to disappear. The sheep and deer scoured the braes and glens for seedlings, preventing the forests from regenerating. In some of the last scraps of forest there are now no trees younger than 150 years. The remaining trees are dying in their boots, unable to reproduce as a result of intensive grazing. Sheep numbers have started to decline, but thanks to increased feeding and laxer management by the estates, deer numbers have exploded: since 1965 red deer in the Highlands have risen from 150,000 to 350,000. The result is that large tracts of the Highlands are now almost completely treeless, and the other plants are grazed to the quick. In the past 30 years there has been a great resurgence of Scottish pride, and a rising anger about the amount of land owned by absentees and managed as an exclusive playground for some of the world’s richest people. With it has come a new interest in the ecology of Scotland, particularly the Caledonian Forest. Groups such as Trees for Life and the John Muir Trust are trying to restore parts of the forest and other habitats, both on their own land and on other people’s. A few more enlightened estates, notably Glenfeshie and Mar Lodge, are at last reducing the overpopulated deer. Already the results are being felt as the ecosystem in these places begins to recover. This is the trend against which the Scottish Gamekeepers’ Association has reacted furiously. Without any sense of irony or embarrassment, the report begins by maintaining that this is no way to treat “Scotland’s iconic animal, the celebrated Monarch of the Glen”. It then goes on to dismiss concerns from Scottish Natural Heritage and other organisations that Sites of Special Scientific Interest are being damaged by trampling. It argues that “deer-prints are inevitable on wild land”. Of course they are. But scattered prints are a different matter to the pressure exerted by overpopulated herds, which can cause the poaching and compaction of soft soils. But the real damage it inflicts on its cause lies in the figures the association has published. It takes as its case study the county of Sutherland, a wide territory in the far north of Scotland, covering 5,200 square kilometres. Of this, the report reveals, 4,000 square kilometres are in the hands of estates, which number just 81. In other words, three-quarters of one of the biggest counties in Britain is owned by 81 families. These aren’t the 1%. They’re the 0.000001%. The report then explains that deer stalking is the main source of employment. Other employment opportunities in areas dominated by large estates, it says, are “very limited”. So it commissioned a survey to discover how many people are employed “in the management and running of the deer enterprises on these estates”. Across the ten it sampled, covering 780 square kilometres, it found 112 people in full-time equivalent employment. Let me run that by you again: 112 people employed on 780 square kilometres. That’s one person for every seven square kilometres. Is there anywhere in Europe, below the Arctic Circle, with a lower level of employment? As the Assynt crofters and the people of Eigg have shown, the land produces a lot more jobs when it is wrested out of the hands of multi-millionaires. The absentee owners and the deer monocultures they sustain prevent not only the ecological regeneration of the region. They also prevent the economic regeneration. Deer stalking, of course, as every industry does, helps to support various ancillary businesses: making tweed jackets and selling venison for example. But these are small by comparison to the employment that could be generated, for example, from wildlife tourism, if the ecosystem is allowed to regenerate and missing species allowed to return. But the report becomes even more self-destructive. Usually people argue in favour of an activity on the grounds that it makes economic sense. This paper argues in favour of deer-stalking on the grounds that it is uneconomic. It finds that the income generated by stalking on the estates throughout Sutherland is £1.6m (a tiny sum when spread across 4,000 square kilometres). Their expenditure on deer management is £4.7m. Stalking can be sustained here only because the bankers or oil sheikhs or mining magnates who own the land are burning money on their expensive pastime. Or, as the report puts it, “providing substantial financial support to remote rural economies.” In other words, even the tiny numbers of people employed by deer-stalking are entirely reliant on the irrational spending of absentee landlords, which could be terminated at any time. The authors of the report come across as apologists for landed power, seeking to preserve the grossly unjust distribution of land and wealth in Scotland – and to sustain a system which prevents both wildlife and a viable economy from returning to the Highlands. But they have done us a favour. They have equipped us with the figures we need to make the case for radical change. * Peter Fraser, Angus MacKenzie, Donald MacKenzie, 2012. The economic importance of red deer to Scotland’s rural economy and the political threat now facing the country’s iconic species. Scottish Gamekeepers Association. I’ll post a link when it’s online.